"Drinks will be at your fingertips with the touch-panel controls, while the machine does all the thinking for you." "The machine uses barcodes on the capsules to change the settings to create the perfect cup every time." "The color-coded coffee and espresso cartridge loading sets make it easy to choose the right one without thinking too hard." "The water reservoir is behind the machine rather than taking up space on the side, so it will fit into a slim space with ease." "Easy to tuck away in a cabinet or in the pantry when not in use, yet it makes full-flavored espresso every time." "Not only does it make an excellent brew, but it also incorporates micro foam frothing technology." "This little device doesn’t need electricity to work...A protective case is also available if you will be traveling and bumping it around a lot." A professional grade machine for the home user, this still offers the simplicity of Nespresso capsules and push-button selection while looking quite impressive on the counter. Ristretto, espresso, lungo, cappuccino, latte, hot milk, or hot water for all your coffee, tea, hot chocolate, or other drinks will be at your fingertips with the touch-panel controls, while the machine does all the thinking for you. 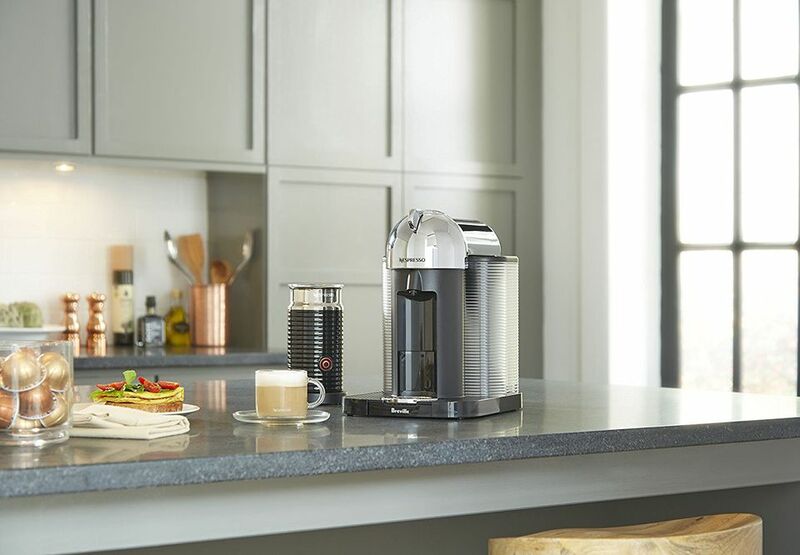 The body is made from durable brushed die-cast stainless steel that will look good for years, while the proprietary heating system transforms cold water to hot in just seconds, while it produces the perfect temperature for each type of coffee. While this might not be for the occasional espresso drinker, it will make a statement and produce excellent results without the need to learn the differences between brews. You’ll be all ready to brew when this arrives since it includes 12 capsules for brewing a variety of coffees to get you acquainted with the machine. This single-cup brewer makes either coffee or espresso, and is designed for use with Vertuo capsules only. The machine uses barcodes on the capsules to change the settings to create the perfect cup every time, and it even makes crema on the larger cup sizes. Besides choosing between coffee and espresso, you can also choose the cup size from a tiny 1.35 expresso shot to a large 14-ounce cup for your travel mug or to share. When it’s time to clean the machine, you’ll get a descaling alert, so you won’t forget that important step. Making this package a little sweeter is the inclusion of the Aeroccino 3 milk frother, so you can froth your milk or cream before adding it to the coffee. When Nespresso doesn’t have a specialty flavor you’re looking for, or if your friend has gifted you with a K-Cup assortment, you can use those cups right along with Nespresso capsules in this one machine. Made for easy adjustments, this has an LED display and simple up/down arrows that let you customize the brewing temperature and cup size. Pressure is automatically regulated, so you don’t need to worry about becoming an espresso expert, while the 19-bar extraction gives you the deep, rich flavor you’re after. On a busy morning, the color-coded coffee and espresso cartridge loading sets make it easy to choose the right one without thinking too hard, and the 40-ounce water reservoir is more than enough for morning brews without refilling. The drip tray moves up and down to accommodate cups and mugs of different sizes while minimizing splashing, and the used cups and capsules eject automatically into a storage bin so you can dispose of them all at once, so cleaning is much easier when the coffee break is over. Small but mighty, this compact espresso maker won’t be hard to find room for, even in a small kitchen. Not much wider than a coffee mug, the water reservoir is behind the machine rather than taking up space on the side, so it will fit into a slim space with ease. Despite the small footprint, this still produces 19 bars of pressure for perfect espresso. This doesn’t have the multiple adjustments that larger machines offer, but that also makes it very simple to operate. Choose between Espresso and Lungo sizes, then just press the button. The water comes to temperature in less than 30 seconds. To save energy, the machine turns off after 9 minutes after you stop brewing coffee. While this machine doesn’t have a lot of frills, it does come with 14 capsules of different types of coffee, so you can discover which you like best before committing to one or two favorites. You know it’s meant to be portable when it comes with a fold-down handle to move it. This compact machine has a small footprint so it’s easy to tuck away in a cabinet or in the pantry when not in use, yet it makes full-flavored espresso every time, with 19 bars of pressure to extract the full-bodied flavor you crave. This includes the Aeroccino 3 that will make hot or cold milk froth for your coffee, or use it to make froth for the kids’ hot chocolate for a special treat. You’ll also get 16 Nespresso capsules, so you can try a variety of flavors to help you choose which you like the best. When espresso is a passion and not just a beverage, this is the machine you need. Not only does it make an excellent brew, but it also incorporates micro foam frothing technology so you can perfect your latte art hearts and flowers, and work your way up to professional designs while doing the morning crossword puzzle in the convenience of your own kitchen. The milk frother is integrated into the machine, so you won’t need a separate device, and you don’t need to pay attention to details since it offers eight different foam textures and 11 different milk temperatures. Along with the technology comes a high-end look, reminiscent of manual espresso machines, but this is so much easier since you simply choose from ristretto, espresso, lungo, latte, cappuccino, flat white, or latte macchiato, adjust the size of the serving, then choose your milk temperature and texture from a menu. The water heats in just three seconds, so you’ll be sipping in no time. Not only is this smart enough to turn you into a kitchen barista, it also lets you know when it’s time to clean and descale the machine to keep it running at peak performance with its self-cleaning function. If that’s not enough extras, this also includes a variety pack of 16 capsules so you can sample different flavors. Great for travelers who want their espresso before they leave the hotel room, or for folks who like the idea of a bit of expresso at work without leaving the office, this little device doesn’t need electricity to work. All you need is hot water, your Nespresso capsules, and just a little bit of effort. There’s a semi-automatic piston inside that injects small amounts of ​water into the grounds with each press, until it reaches the correct extraction pressure. For more versatility at home, there are water tanks of different capacities available to make different types of coffee in different sizes. A protective case is also available if you will be traveling and bumping it around a lot. While this doesn’t have the convenience of pushing a button and letting the machine do all the work, it takes very little storage space, whether you keep it in a kitchen cabinet, a desk drawer, or whether it travels with you in your luggage.